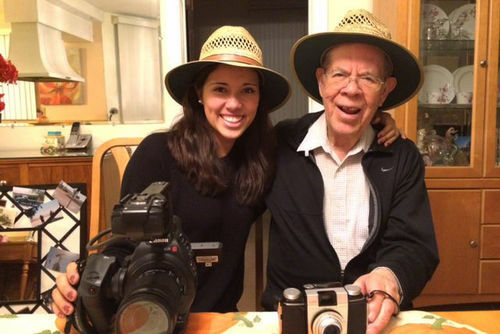 Crystal Avila ’17 and her grandfather, Jesύs Villanueva, in a scene from her documentary, Beneath the Trees. In the first film, television, and theatre course she took at Notre Dame, Crystal Avila ’17 was assigned to write her own graphic novel. She chose a story that was close to home. Her grandfather, Jesύs Villanueva, had recently been diagnosed with memory loss. Over the next few years, Avila discovered documentary filmmaking as an intersection of journalism, art, music, and storytelling. She also continued to talk to her grandfather in Chicago as his memory declined, asking him to share his life experiences. For her senior thesis, her interests coalesced into a documentary, Beneath the Trees (Debjao de los árboles). The film tells the story of one memory, one episode in her grandfather’s life that he returned to over and over, Avila said. 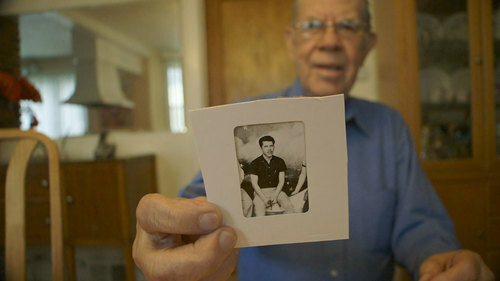 More than 60 years ago, Villanueva had traveled from his home in a small village in Mexico to the United States border. It took several tries, involving a 10- to 15-mile walk, to actually get across. Once he was in the U.S., Villanueva stayed in Yuma, Ariz., where he got a job picking cotton for 35 cents a day. Without a home, he slept beneath trees for years. Beneath the Trees features many photographs Villanueva took after coming to Arizona from his small village in Mexico. Avila filmed the documentary during the summer and fall of 2016. She traveled to Chicago several times to interview Villanueva, showing him and her grandmother, Maria, the footage after each interview. The interviews heavily featured pictures Jesύs had taken during his time in Yuma. The production was a family affair — Avila’s mother and youngest sister helped with producing and filming, and her sister, Jasmin Avila, wrote and sang three songs for the film. During filming, they traveled to Yuma to retrace Jesύs’ steps. The documentary was first screened at the Notre Dame Student Film Festival, where it won the Audience Choice Award. Avila continued to edit the film, and it premiered in February at the Big Sky Documentary Film Festival, where it was one of 10 films selected for the fest’s Oscar-qualifying competition. It has been accepted to the Cine Las Americas International Film Festival in Austin, Texas, and it screened last month at the Minneapolis St. Paul International Film Festival, where it was nominated for best short documentary film and Avila was up for the best female filmmaker award. Majoring in FTT, Avila said, gave her access to the resources and technical skill she needed to make Beneath the Trees, as well as support and encouragement to pursue a passion project. She said Olivier Morel, who taught Avila’s first course on graphic novels and later advised her senior thesis, gave her the freedom to take her project beyond Notre Dame. “They say, ‘We give you the tools you need, but you have to use your brain and your heart to make your project,’” she said. Avila, who is now working as a producer at a film company in Chicago and wants to make more documentaries about memory, said she hopes to make Beneath the Trees available online and to screen it in classrooms. “Preserving the stories of our grandparents is so precious,” she said. “You have to take the time to sit down with them and capture their stories through whatever medium you have. Avila in a scene from the documentary. And, just as Villanueva created memories by taking pictures of his time in Yuma, Avila and her family have created their own memories by making Beneath the Trees. When the documentary won its award at the Notre Dame Student Film Festival, Avila pointed out her grandparents, sitting in the back row of the theater, to the audience. People asked to take pictures with her and them, she said. Originally published by Emily McConville at al.nd.edu on April 26, 2018.